It has been some time for me, but I have decided to take up a new project, one that I think will be quite a step up from anything else I've ever attempted in TI-Basic: Skyrim CE! I will also be (and already am) writing weekly about the development process on my Quora blog, though I won't be getting too technical. Once the game is released, I will include full documentation and a pack for modding to hopefully give a clear picture of how all the components of Skyrim CE come together. There's still plenty to be figured out, and your input is of course invaluable to the design process. I've got a good roadmap for the next few months of development, and hope to release a trailer and gameplay demo sometime in December or January. The full game will probably be released in Spring 2019. I hope to push the limits of TI-Basic with this project, and would appreciate you guys helping to spread the news! Until then, I will keep you all posted about important updates, and hopefully with some ways that you can help make this game the best that it can be. Concerning graphics, text symbols are not a problem for me. dont loose time with too much graphics. If you dont need fast sprite you can also use TEXTLIB to stay in TI-BASIC and have fast colored text colour enhancement. Thanks. 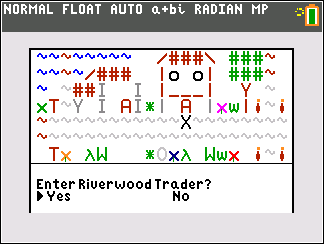 I don't plan on using ICE, mainly because I want to keep this game in pure TI-Basic. If speed really starts to be an issue I might learn ICE cause it is quite useful. And some of the characters you see on the screen I did get via TEXTLIB. Very nice! The graphics look incredible for a BASIC program! How long does it take to render each area? Like Dear Friend suggested, when you're finish with the BASIC version of this, I'd love to see a version written in ICE or C! Thank you! Each area (or "sector", as I've come to call them technically) takes about 10-15 seconds to draw, depending on how much whitespace there is. I'm designing the game so you are able to spend a lot of time in each sector to keep load times down. I'm also trying to implement a version a "load screen" similar to actual Skryim, whereby multiple sectors are decompressed at a time. I've just looked over the documentation for ICE and it doesn't look too bad to learn; I think though I will definitely save the venture for after the BASIC version is done. Very nice! 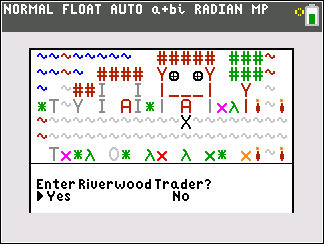 I always love it when people create complex worlds and fun experiences within their calculator games, but do so by pushing the limits of TI-BASIC (cough like I did with 8K Adventure cough). Even though you're technically a Cemetech newbie, I can see that you really know your stuff. I can't wait to see where this project goes! The idea to make Skyrim CE came originally for an RPG engine I was working on, which is not too dissimilar from your 8K Adventures it would seem. And yes, I am a Cemetech newbie but I've been on TI|BD for over 3 years, and coding in BASIC for about six. I just never really got around to making an account here ha ha. Also, ICE is super similar to basic. Just a few new things, including the syntax and the graphics canvas, and you have ICE under your grasp. Ok sor jcgter777 , who wrote it ? Anyway nice work! It's always good to see just how good programs can be in pure basic. It seems rather ambitious, let us know if you need help with level creation and whatnot! Our lord and savior Dr. Kerm. Thanks for the kind words and generous offer. I've got a system going to design levels on my laptop via a level designer I threw together in Python, but if I were to compile it into an app or something other people could pitch in that way. I'd imagine many of you here are quite good at the technical bits, so if I run into some tough problems with compression or code timings I'm sure you guys will be lots of help. I'll keep you all posted. *bump*. Have you made any progress on the game lately? I'd love to see more updates. This looks to be a promising project. I've also finished planning out pretty much all of the data allocation; I have this big fear that I will get far into the game and realize I missed some important feature that will be a nightmare to go back and work in, so I'm trying to account for every eventuality I can before I start writing to much. It is looking like the Alpha will be done by New Year's, which will comprise of the main quest from Helgen to the first dragon fight at the Western Watchtower (and some other bits and bobs). I'll keep you posted. I like ASCII graphics, so I'm excited to see this. Despite never having played Skyrim. How's the project going? Have you run into any barriers yet? We're happy to help if you have! I suppose it's time for a long-overdue update. How's the project going? : In a word, slowly. My motivation to work on it has fluctuated greatly since December, with college not really helping in this regard. Progress has not been negative, but still not as quick as I'd like (which I can really only blame myself for). Most of the progress has been in all the "supporting" elements of the project: documentation, big excel spreadsheets of level data, and some Python scripts for designing levels and creating characters, quests, etc. (similar to Bethesda's Creation Kit tools). Have you run into any barriers yet? : Oh, several over the past few months, but none which are truly halting development other than the sheer scale of the project (which, again, I only have myself to blame). Mateo helped out a little while ago with some memory allocation improvements, and after I overhauled the entire engine back in January(?) the path to completion has been fairly straightforward. January was supposed to be when I had an Alpha to show everyone, but we all know that didn't happen. I'm now at the point where I think I'm going to avoid working on it directly until after finals (beginning of May), and instead only work on improving my workflow (perfecting those Python scripts, figuring out a good way to use SourceCoder, purging my calc of my side-projects for the time being, maybe actually using GitHub?). So...yeah. I'm your typical Indie developer: promised January and now you're probably getting June. I appreciate your offer for assistance, but honestly at this point the only roadblock is me being lazy. I suppose I could use help with content production once that's all streamlined, though I'm not sure how easy that is to facilitate. I will, though, appreciate assistance with Alpha testing and debugging once I release that. It will be a small Alpha in terms of scope and percentage of the full game, but should include every important aspect of gameplay (quests, dialogue, combat, merchants, cutscenes, etc.). Thanks for checking up on this and reminding me that other people care about me meeting my deadlines. Please wake me up again if I'm sleeping in June. © Copyright 2000-2019 Cemetech & Christopher Mitchell :: Page Execution Time: 0.177916 seconds.